Long time veteran Jake Stergios held off the likes of Ray Alfalla, Chris Overland, and Josh Berry to claim victory in round 2 of the Nascar Peak Antifreeze Series powered by iracing.com at the Atlanta Motor Speedway. 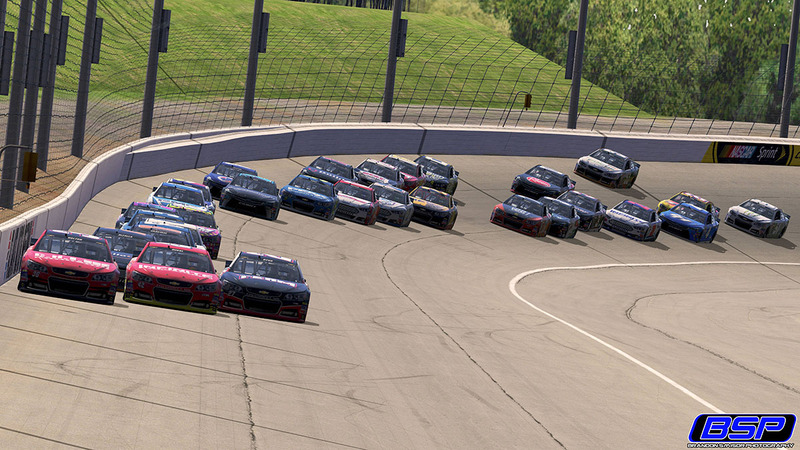 Tuesday night’s race began with The TEAM’s Cody Byus taking pole and leading the field to green. He was closely followed by Corey Vincent and Dylan Duval, who qualified 2nd and 3rd respectively. Byus would lead the first five laps before surrendering the lead to Galeforce’s Brad Mahar. As the opening laps continued on, drivers began searching for grip by running multiple lanes and trying to figure out where their car handled best. The outside became the popular groove, allowing drivers to make passes and conserve tires at the same time. Michael Conti took great advantage of this, moving from the 15th starting spot up to 8th. Lap 16 brought the race’s first caution when Brad Davies made contact into the wall and collected Ryan Borges. Tyler Hudson, who started from pit road and was deep in the field, narrowly escaped the crash. He would, however, receive the lucky dog and get back on the lead lap. After quick pit stops, Mahar retained the lead and led the field back to green on lap 20. Justin Bolton mounted a charge on the inside lane a bring his car to lead by lap 23. Bolton’s reign would last one lap before Michael Conti completed his surge toward the front by taking over the lead on the following lap. Close battles continued throughout the early stages of the green flag run, with Alfalla and Byus making their way into the top 5. Conti would eventually be passed for the lead by Byus, who initiated his return to the lead on lap 36. The long green flag run would bring struggles for some of the favorited drivers, with Mahar dropping back outside the top 10 and Bryan Blackford continuing his struggles outside the top 25. The old tires would not prove to be a disadvantage for Bolton, who retook the lead over Byus on lap 47. This exchange would happen just before Nicholas Johnston received a tap from Ryan Lowe and spun around to bring out the race’s 2nd caution. Bolton would resume the point after pit stops and the wave of the green flag. Byron Daley had a scare on the restart when he had trouble with wheel spin, dropping him outside the top 30. The field used the restart to spread out and log laps toward the halfway point. This gave a favorable advantage to a newcomer of the top 3 in Patrick Crabtree, who took the lead on lap 70 and established his command of the race. The extended run also gave last week’s winner Allen Boes a chance to show his long run speed, as he made his way into the top 12. Alfalla would retake the lead on lap 80 and eventually bring his machine to pit road, signaling the start to green flag pit stops. And with an effort to stay on sequence, a rush of drivers dashed into the pits all at once, creating a stack up that eventually resulted with Casey Tucker and Alex Warren going around before pit entry. This sequence of spins resulted in a mix up of the running order and the race’s third caution. Green flag racing resumed once again on lap 87 with Josh Berry in command. Boes followed pursuit in 2nd with the likes of Jake Stergios and Tyler Hudson not too far behind. Stergios would eventually rocket to the lead just before the race’s 4th caution when Matt Bussa made contact with Tyler Hill. Hill would spin down the back straightaway and narrowly be avoided by teammate Adam Gilliland, who spun and hit the inside wall in desperation. The quick caution would prompt most drivers to pit road, with eight drivers electing to stay out and inherit the first eight spots. Jake Stergios would continue his command of the top spot when he led the field back to green on lap 95. A slight difference in tires up front still created some fantastic racing with PJ Stergios (brother of Jake) made his way into the top 3 while working the high lane. Soon after, though, a wreck mid pack occurred to bring out the race’s 5th caution. This involved several competitors including last year’s champ Kenny Humpe. All drivers would pit under the yellow. Lap 104 signaled the next restart, with Bolton back in command on the inside lane. He would be closely pursued by Crabtree, who eventually put his car back in the lead on lap 110. Green flag fever continued with the race not seeing a caution in the final 63 laps. Jake Stergios would retake the lead on lap 125 and pull away before the final set of pit stops began on lap 130. One by one, the drivers made their way down pit lane for routine service and just enough fuel to make it to the end. This would be interrupted on lap 138 when Shane Dougherty kept his car on track and would stay out lead for awhile. Dougherty would look for a caution that never came and eventually surrender the lead on lap 146 to Alfalla. The leaders of Alfalla and Berry would have seemed to develop a comfortable gap from the field, but not before Jake Stergios rocketed back to the front. Stergios showed his late race speed by passing the top 2 with 8 to go and instituting the final lead change of the night. He would lead the rest of the race and cross the finish line as the victor in round 2 at the Atlanta Motor Speedway. The effort gave Stergios his third career Nascar Peak Antifreeze Series win and second place in the points standings, just one point out the lead. Allen Boes, who finished 8th, retained his reign above the standings with the rest of the top 5 including Ray Alfalla, PJ Stergios, and Brandon Schmidt respectively. The Nascar Peak Antifreeze Series is off next week but will return to action March 15th at the Phoenix International Raceway. This will give the drivers their first short track challenge of the season while prompting even greater excitement on the racetrack. Tune in then to watch the boys battle it out in the sun!